Sitting on the beach, on one of those always sunny summer days. Suddenly the silence is shattered as a former LMS pacific speeds past on a Scotland bound train. These are the images we have attempted to recreate in model form. The West Coast Main Line at the end of the steam era and before the overhead electrification marched northwards to Scotland. Arrowmouth is a seaside town on the North West Coast and is close to Hest Bank, which is between Lancaster and Carnforth. The layout is based on the former London North Western Railway main line. The era is somewhere between 1963 and 1968 when steam was in its Indian Summer, in this part of the world. The scale is 4mm using "OO" gauge track. All the buildings on the layout are scratch built, mainly using thick card for the basic structure. These were covered with either brick papers or plasticard to represent stone or brick finishes. Various grades of sand papers have also been used to represent concrete rendering which, is so often found at seaside towns. The layout has been created as a package of not just the layout but also correctly formed trains for the era portrayed. This does not mean detailed locomotives pulling out of the box ready to run stock. More recently the layout has undergone a major refurbishment to bring it up to the standards of the Club's newer layouts. 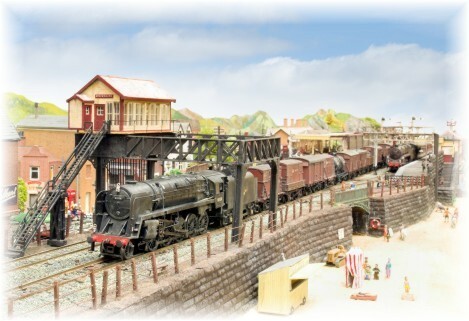 This has included totally a re-modelled the goods yard area with a new track layout and completely new scenery on both corners of the layout.